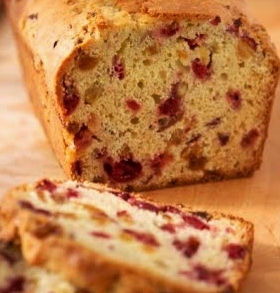 The combination of sweet bread with special taste of cranberries and irrestible flavour of orange will make this a definite favourite for your holdiay treat selection. You can serve it for breakfast, brunch or dessert with lunch or dinner – it lends itself to any occassion. And you can make it ahead of time and freeze it for whenever you choose to serve it, it tastes just as good after you take it out of the freezer. Stir in orange zest, cranberries, and pecans. Beat in flour mixture until just moistened. Bake for 1 hour in the preheated oven, or until the bread springs back when lightly touched. Let stand 10 minutes, then turn out onto a wire rack to cool. Wrap in plastic when completely cool.